Drought tolerant plants, xeriscape, water wise gardens are the gardening vocabulary that we are likely to see for some time to come, particularly in Southern California. Since there is a limited amount of water that can be extracted from our watersheds before significant environmental consequences are obvious to us all. It seems prudent to use plants that are native to our region or from one that is very similar. And to choose plants that are both beautiful and come from the dryer sections of these landscapes. 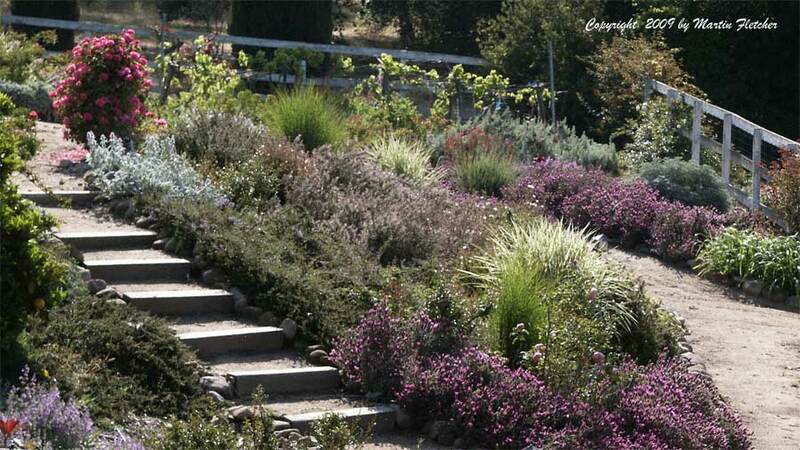 At first glance it might be thought that a drought tolerant garden limits the garden to a "desert" look. But there are so many plants well adapted to our climate that almost any garden style can be created, maybe with the exceptions of tropical rain forest but even that look can be had with plants that only take a gentle sip. To merely ask the question "is it a native California plant?" when choosing plants for your garden, this allows the use of a wide range of aquatic and near aquatic plants as well as desert plants but does not address the water requirements of those plants. To widen the view but to narrow the horticultural focus to plants that can withstand our seasons with minimal irrigation seems to be the critical issue. The American Southwest, Mexico, Australia, New Zealand, South Africa, Chile, and the Mediterranean all are sources for beautiful plants that come from climates that are similar to ours and are regular survivors of severe drought. Sprinkler EffeciencyIn this world of increasing automation it is easy to program the timer to provide enough water so that even the thirsty plants have their appetites quenched. One of the most surprising lessons in my gardening career was when the local municipality told us to turn off all sprinkler systems. Predictably the lawns turned brown and crunched while you walked on them. The surprising part to me was how many plants actually did better. For years we have had drought tolerant plants produced by our local nurseries that were often over-watered they and rotted in our landscapes. Look to our review of Smart Sprinkler Timers to find something that matches with how much effort you want to put forth to match attention to effect. Plant small Go to the nursery looking for pretty flowers and you are likely to be dissappointed if you are trying to find a drought tolerant plant. One of the greatest challenges for the plant buying public is to get well enough educated about drought tolerant plants so we go to a garden center knowing what we want to buy. Small plants that are not currently flowering are probably the ones we should really want. In spite of sometimes looking rather awful in their containers there a huge list of drought tolerant plants will flourish in our landscapes, as the list below will attest. If we wait for them to be big and overflowing their containers they often transition badly into the landscape. We should be buying a plant because we know what it will do in our garden rather than what impulse we feel when we look at that plant. Many of the plants on this list have a relatively short life span. There is little point in having the larger part of their life spent distressed by being strangled by a nursery container. Plants do not fare well with the chloramines and other water sanitizing chemicals. No surprise, the point of the chemicals is to kill the microscopic plants and animals that might make us sick drinking the water. The result so far as the plants are concerned, an inch of irrigated water or an inch of rain on the landscape do not produce the same results. It is easy to see how happy the plants are when we finally get the natural choice. I spend a significant part of my time in gardens trying to fix the soil chemistry caused by our water. Fall is when a plant's roots will grow the most. This is the easiest time to get a drought tolerant garden established. Healthy roots lead to robust foliage in the Spring and lots of flowers. Spring is when the plants main energy is spent on flowers and seeds. If the roots are not fully established summer survival is a trial, and a race between dehydration and rot. Drought tolerant plants are only capable of withstanding a drought if their roots are well established into the surrounding soil. This drought tolerant plants list is compiled from our observations of the plant survivors from neglected gardens. So many times we have found some plant fully in its glory thriving in spite of the neglect. And from plants on the margins of the irrigated zone where in spite of their lean providence they shine anyways. This list is by no means complete, but as you can see there are plenty of drought tolerant plants to fill your yard, school, or park without bothering to repeat.